This entry was posted on January 15, 2019 by piranha. Would you believe that street vending only became legal in Los Angeles, USA, from 1 January 2019 after Governor Jerry Brown signed a sweeping new law in September 2018 to regulate street vending practices for California? This is a massive move forward for those who are selling food on the city streets: they will no longer be doing this illegally and will now be officially contributing to the local economy. Street vending has long been a divided issue in Los Angeles and was catapulted into the spotlight in summer 2018 when a vendor had his cart violently overturned by an attacker. This was captured by a passer-by on video and quickly went viral. Not only will street vendors now be legitimised and regulated, there’s even more good news. Street vendors with previous citations and convictions will now be able to clear their record. An ancient and important occupation found in virtually every country, and major city around the globe, street vendors are positively associated with contributing to economic activity and adding vitality to the streetscape. But, on the other hand, many people associate them with causing congestion, posing health and safety risk, avoiding taxes and selling substandard food. The Universal Declaration of Human Rights goes as far as protecting the economic rights of street vendors. And many street vending organisations have successfully petitioned for street vendors’ rights to be upheld and for these not to be violated by banning street trade. Street vendors can represent a major attraction for tourists and allows people a bustling open air experience bringing vitality to public spaces in cities. In smaller communities, street vendors are a vital cog in the distribution network and can contribute to market competition. 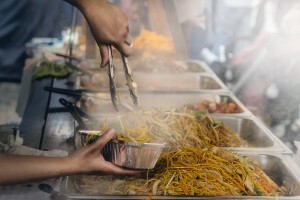 In the UK, the Nationwide Caterers Association has set up Streetfood.org.uk in recognition of streetfood’s increasing contribution to our economy and culture. The organisation provides caterers with the information, system and support they need to be safe, legal and profitable. They are starting a ‘street food revolution’ for an exploding industry. The UK is fast gaining a reputation for its wide variety and high quality of street food, which started in Asia, is massive in America, and is now firmly finding its feet in Europe. Street food is eaten at markets, at special events, in disused warehouses, at food festivals and on the high street. From French street food sold from a hut in Altrincham Market, including delicious rotisserie chickens flavoured with garlic, thyme and rosemary, to Greet Label’s vegan street food sold in meze boxes across the country and Northern Ireland’s Cuban sandwich factory, there’s something for everyone and a potentially successful business for the right person. If you’ve got an interesting food offering and great business acumen, why not check out whether starting your own street food vending business could be just the opportunity you’ve been waiting for. And, even better, why not go for it with the best in show – a Cinders Street Wok introduces new technology to an ancient method of cooking, solving problems of noise and skill levels inherent in traditional wok burner.